As a marvel of engineering, the Hoover Dam would inevitably be associated with the modern. No dam of this scale had been attempted before; that fact that technological innovations were required to build it was understood implicitly. In this context, though, the word modern simply implies advancement, an adherence to the forward-looking quality of design as new materials and new techniques became available through the first half of the twentieth century. The Hoover Dam also became an icon of modernism, that certain mode of design which emerged from Europe in as disparate forms as Gropius's Bauhaus or the 1925 Paris Arts Decoratif et Industrials Modernes show; out of these came the International Style and Art Deco. Although the Hoover Dam's design was not specifically allied with a sub-movement of modernism, the attempt was made to create an aesthetically pleasing--and Modern--facade. 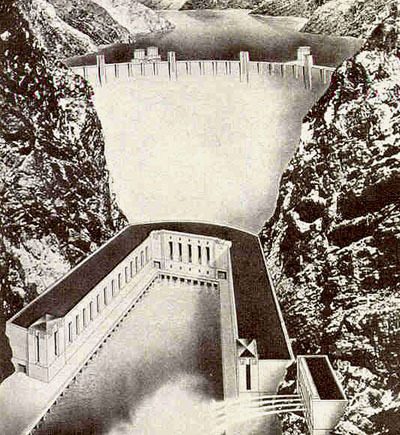 The original design for the dam's facade by Bureau of Reclamation engineers made it clear that an architect needed to be brought in. Although the engineers' design was highly functional, the unbalanced outlet houses, government-office powerhouse, and massive eagles set on the roadway towers clashed violently with the image projected of Hoover Dam as a modern structure. Kaufmann also redesigned the spillways to be more streamlined, added lights to the top of the intake towers for nighttime effect, and reworked the powerhouse in a modernist, stripped-classicism style (Wilson, 304-305). 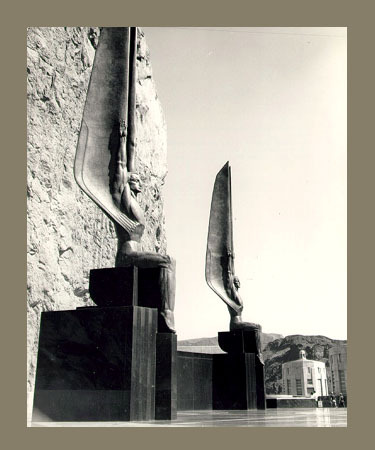 Further, a competition to find a monument for the dam was arranged; the winner was Oskar Hansen, whose strange winged figures, seated but still thirty feet tall, now adorn the site. Wilson notes that "these surrealistic apparitions underscored the unreality of a dam and lake in the middle of a hostile desert" (309). Hansen also was responsible for a star map set in the floor of the monument; this map, indicating dates of historical importance, linked the moment the Hoover Dam was dedicated with such events as the building of the pyramids and the birth of Christ. 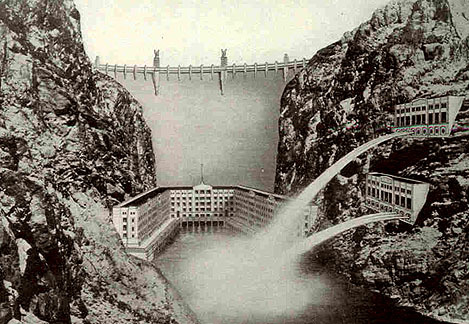 Hansen believed that "in remote ages to come, intelligent people" would be able to discern "the astronomical time of the dam's dedication" (Wilson, 310). The alliance between the modernism of the engineering and architecture of the Hoover Dam renders it a coherent and cohesive structure. Because of Kaufmann's design, the engineering feat is appropriately reflected in the magnificence of the facade. Indeed, as an icon of modernism, the Hoover Dam helped to usher in a new era.